"First Class Dining soup recipe, refreshing taste, full of flavour." Melt butter in a large pot over medium heat. Add onion and garlic, and cook for about 5 minutes, until softened. Add sweet potatoes, and chicken stock. Season with cumin, chili flakes and ginger. Bring to a boil. Reduce heat to low, cover, and simmer for 15 minutes, until potatoes are tender. Puree the soup using an immersion blender or regular blender. If using a counter top blender, puree in small batches, filling the blender just a bit past half way to avoid spillage. Whisk peanut butter into the soup, and heat through. Stir in lime juice, and salt. This is alright, but not great. I followed the directions exactly except that I substituted one tsp of ground ginger for the fresh ginger. 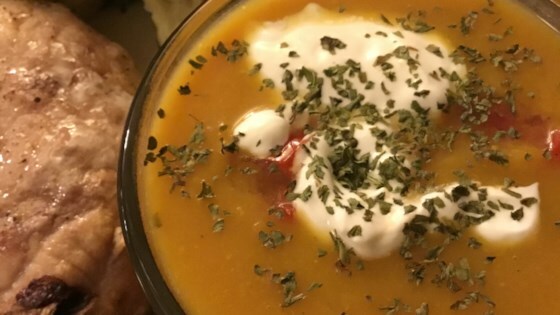 This was honestly one of the very best soups I've ever made -- and my friends call me the Soup Nazi. I didn't have cumin in the house at the time, but it was wonderful anyway. YUM!! !